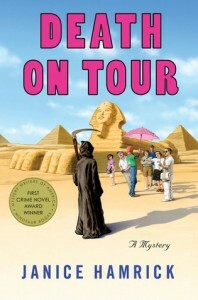 Texas high school teacher Jocelyn Shore and her cousin Kyla are on a once-in-a-lifetime guided tour of Egypt with a motley crew of fellow travelers when the most odious of the bunch, a nosy, disagreeable woman named Millie Owens, takes a fatal fall off of one of the great pyramids. And that’s only the beginning of their troubles. From the jovial doctor haggling for trinkets he doesn’t want to the mysterious impostor wearing someone else’s clothing to the attractive stranger traveling alone, this group of tourists is carrying more than one kind of baggage. Add a mistaken identity, a priceless necklace, and another unexpected death, and Jocelyn finds herself reluctantly trying to unravel an intrigue that threatens to end not only her vacation, but her life. Janice Hamrick’s Mystery Writers of America/Minotaur Books Competition winner Death on Tour is a delightful debut and the beginning of a wonderfully charming cozy series featuring Jocelyn Shore, the determined teacher who always seems to get wrapped up in a mystery, against her usually very sound judgment. Janice Hamrick is the winner of the 2010 Mystery Writers of America/Minotaur Books First Crime Novel Competition. Born in Oklahoma and raised in Kansas, she now lives in Austin, Texas, with her two daughters. Jocelyn and Kyla are cousins but look enough alike to be sisters. When Jocelyn’s marriage breaks apart, the two decide to take a trip of a life time to Egypt with a tour group. As they get to know their travel mates, the group’s busy body turns up dead. She becomes even more suspicious about the group after finding said busy body’s pack with a note book full of observations about them. As the tour progresses, strange men approach Jocelyn and her cousin asking them if they are “the sisters from Utah” and giving them things. Now that Jocelyn is divorced, she has no interest in men except one nice guy on the tour named Allen. Unfortunately, Kyla has claimed him, just like when they were in high school. The descriptions in this book are breath-taking. I know I will never get to Egypt but this seems to be the next best thing for me. I truly enjoyed getting to know Jocelyn and her cousin with all the wonderful dialogue between the two and with the other minor characters. There is enough suspense to keep you turning the pages but nothing uncomfortable like some other mysteries that I have read. This is just pure, clean fun! There are so many other little mysteries that all add up the big finale. I felt like I was reading my first Stephanie Plum book all over again with the right blend of humor and tension. I can’t wait until Death Makes the Cut comes out this July. I hope there are many more adventures in store for me with Jocelyn. WANT TO WIN A COPY OF THIS *SIGNED* BOOK? This sounds like a hoot of a read and I am really looking forward to it. Thank you for sharing and for the lovely giveaway opportunity. I’ve been following your reviews for a while;however, I just discovereed that you write mysteries, I look forward to reading your work! Liked for Google plus on 5/21. Thanks for the chance to win! I love mysteries. A good mystery in an awesome setting. Sounds like one I’d love. this sounds like I would really enjoy it. Google + again today, but now I can’t find it to show you the link? This is the first time I’ve tried to do Google plus twice, does it only work once?